I've had a little trouble trying to figure out how to best tell the Tom Evans story simply because there is so much to tell. I'm going to have to break it into several articles. I want to tell you about how Tom got started in audio; what his design convictions and innovations are; describe the components in his product lines; do thorough reviews of each of the components I have in for review; and then comment about the synergy of using these components together in my personal system. That's a lot of ground to cover. For today, I'm going to handle a little introductory background on how Tom got started in audio; some of his design philosophy; and finally review his new Linear A amplifier. In the next article, I'll delve further into Tom's design innovations and philosophy, provide an overview of his present product line and review the Vibe Series 7 preamplifier with the optional Pulse power supply. Finally, I'll wrap up with a third article that will review the Groove Plus phono stage and discuss the rather remarkable synergy when using all these pieces together with my Avantgarde Duos. Like many of us, Tom Evans got interested in music as a youngster by being exposed to music in his parents' home. In Tom's case, that was classical music but kids being kids, he soon discovered the popular music of his time and place. Tom especially liked the space rock group Hawkwind formed in 1969, which later went on to international fame with albums like Hawkwind, In Search of Space and Doremi Fasol Latido. These days, Tom enjoys listening to the music of the late Frank Zappa, the 1960s psychedelic band Electric Prunes, blues-rockers Led Zeppelin and Robert Plant's Mighty Rearranger. Tom first became interested in HiFi at eleven when he began to wonder how audio equipment created the illusion of live music. His first HiFi rig consisted of an Acoustic Research XAU turntable, an NAD integrated amplifier and Acoustic Research AR18 loudspeakers. Tom didn't care for the sound of the NAD but since it had preamp outputs, he was able to use a Leak Stereo 20 valve amplifier for a much more musically satisfying combination. As Tom's interest in electronics grew in his late teens, he developed a close relationship with disabled design engineer John White who mentored him in the fine art of audio design. Tom credits this relationship as forming the foundation for his present design acumen. He continually quizzed John about the what, where, why and how of everything to do with audio design and electronic equipment in general and in the process discovered an important fact: "I'd learned a strange thing about how little things change things in a big way." Tom attended college and studied psychology but realized he was "more interested in learning how the ear and brain worked in response to music" than he was in studying regular psychology. Tom's instructors nurtured his interests with books on ear-brain phenomena but their student finally concluded that his interests did not lie with psychology so he returned to his first love - working with electronics. Like a lot talented young scientists & engineers, Tom lent his electronics skills to the defense community where he worked until the mid '80s. However, he never did forget his love of audio electronics and music and eventually left defense work to pursue audio. The defense work turned out to be time well spent. Hee was able to obtain permission for using some of the hi-tech government-developed parts in his design work that was not available to other designers in the audio community. Starting his design career in the mid '80s, Evans developed an analog error correction circuit whose design principles incorporated 6-layer printed circuit boards to optimize the circuit used in the Finestra preamplifier Tom designed for EC Audio. The Finestra is still recognized by the audio underground as an excellent budget preamplifier and phono stage. 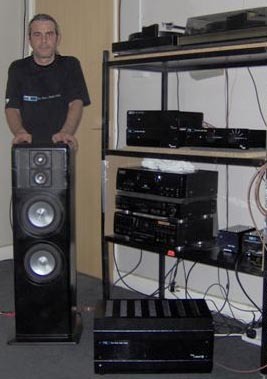 After that first foray into the world of professional audio design, Tom founded -- you guessed it -- Audio Design in 1989 and moved to the Welsh Valleys where he designed the highly regarded Iso phono stage for J.A. Michell Engineering in London. 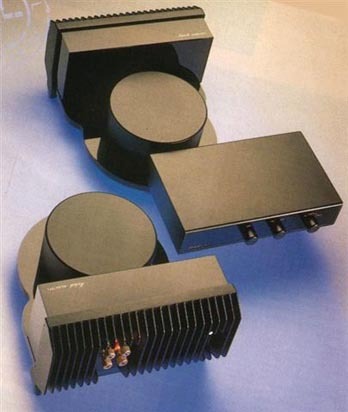 In 1992-3, Michell Engineering again retained Tom's design skills for their Argo preamplifier and Alecto power amplifiers [right]. In 1995, Tom formed Acoustic Precision with Patrick Handscombe and together, they designed the FR1 loudspeaker and Eikos CD player. The plain looking and terrific sounding $3000 Eikos was based on the humble $650 Pioneer PD-904 CD player but Tom hot-rodded it to an extraordinary degree with 10 of his first iterations of the proprietary Lithos regulators, Elna Cerafine & Nichicon Muse capacitors, a high performance output circuit and Tom's favorite version of the Trichord clock (a high-precision oscillator module that replaced the player's stock unit). It was during the Eikos CD player project that Tom first started development of the Lithos range of regulators, an event that would dramatically alter the performance envelope of his designs. Tom believed that the ultimate performance of his designs was let down by the voltage regulators commercially available at the time. The best of them suffered voltage noise equivalent to the output of a moving coil cartridge! Think about that for a moment: If you want to uncover all of the information contained in very small audio signals, you need a big audio signal and vanishingly low noise to get the most out of your music. If noise and signal are distributed evenly, a substantial amount of raw data is irretrievably lost. The very slow transient response and recovery time of these noisy regulators further compounded the problem of signal degradation. In response to the regulator problem, Tom began to develop his own high-performance high-speed regulators. Dubbed Lithos, they would eventually provide the level of performance needed to begin his assault on the state-of-art in audio amplification. When all was said and done, Tom had developed a custom high performance regulator that consisted of a small printed circuit board packed with surface mount devices (SMDs) that was a staggering 1000 times quieter, 53 times faster and 100,000 times more accurate than the best commercially available regulators used for audio applications. These Lithos regulators provided huge advancements in speed and resolution that made for a much better sounding, more detailed and life-like musical experience. That first Lithos D was a fixed 5V regulator. Tom's work caught the attention of Pioneer GB who in 1995 signed him to a 5-year contract to develop a hot-rodded budget system for the UK market. Evans designed the Pioneer Precision range of products that included a CD player, tuner, integrated amp and cassette deck. Tom comments that the Precision designs had greatly enhanced performance. "To this day, I have a lot of respect for Pioneer, their products and dedicated staff for their commitment to offer the budget HiFi market place high-performance designs." 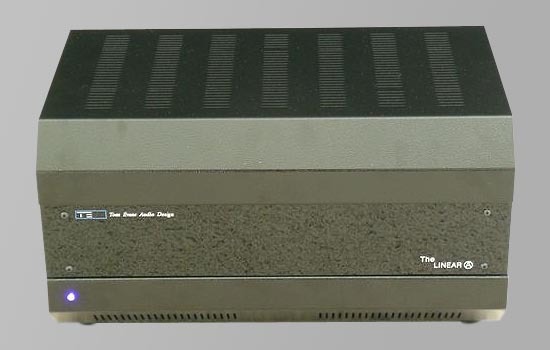 In 1998, one of Tom's UK dealers, Audio T in Reading, pestered him to design an ultimate performance phono preamplifier. Tom took up the challenge and developed the design now known as Groove. The first Groove contained Tom's original Lithos A regulator with adjustable +/- voltage from the Eikos output stage, which in 1999 would be fitted to the early Microgroove Plus phono preamplifier. The Microgroove & Microgroove Plus phonostages were developed as high-performance budget wonders to introduce Lithos hot-rod performance to audio everymen. In 2001, Tom continued development of the Lithos technology and produced versions 3, 4, and 5, also made available for third-party OEM use. In mid-2001, Tom released the Vibe linestage, which received much critical acclaim from owners and the HiFi press. In January of 2003, Tom released the Lithos 7 to replace the Lithos A regulator in the Groove & Microgroove Plus phonostages and the Vibe preamplifier. Also in January of 2003, Tom debuted the Lithos 6, which he refers to as "the big one". The Lithos 6 circuit is used in the Pulse power supply to "greatly enhance the performance of the Vibe Lithos 7 preamplifiers." Later in the same year, Tom combined the Pulse power supply with the Groove phono stage to form the Groove Plus with similar increases in performance. 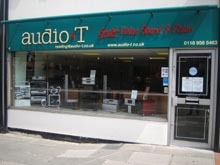 In October of 2003, Tom moved into larger premises to satisfy the increasing demand for his products and to continue his design work and search for ultimate performance from home audio electronics. In January of 2004, Tom started work on the single-ended Class A Linear A 25wpc stereo power amplifier with Peter Chappell, an industrial transformer designer who also collaborates with Art Audio. Tom finished the prototype of the Linear A in May and sent the first production model to the Heathrow HiFi Show in September. Demand for the Linear A has kept it in weekly production ever since. In April of 2005, the Class A Linear B 55-watt fully differential monoblock version -- another combined effort by Tom Evans and Peter Chappell -- was finished and first units began to ship to dealers and distributors worldwide. These days, Tom spends quite a lot of his time doing audio design for his company Tom Evans Audio Design, often listening to music in his Welsh factory listening room until two or three in the morning. Wales is fittingly known as 'The Land of Song'. Evans makes sure he gets a little time to unwind, down at his favorite pub over a few beers with his buddy Ned who happens to be the lead guitarist for the Van Morrison Band. Tom quips that the Linear A has been "a lifetime in the making" and represents the best of what he has learned over the years. You might even say that the Linear A has been two lifetimes in the making as it is the collaborative result of Tom and Peter Chappell. "Take Peter and I who are both industrial design engineers with over 20 years of design experience each. Mine is in the electronics industry, Peter's in the transformer sector. Both of us have worked for ministry of defense suppliers in the UK. Put that experience together with our common interest in music and it's a given that we'd start tinkering with our HiFi systems. We're of differing views on what's best from an engineering perspective but have agreed to bow to each other in our respective areas of expertise and pool our knowledge for the best possible results." The Linear A is an ultra-wide bandwidth stereo amplifier with a claimed flat response from 12Hz to 90KHz and "vanishingly low levels of distortion". The Linear A is rated at 25.2wpc operating Class A, with output noise 150dB down at 700 microvolts! Note the distinction between microvolts (one millionth of a volt) and the millivolts rating (one thousandth of a volt) of most amps. Microvolts are a thousand times less. Output impedance is 0.5 ohms, input sensitivity 0.7V. for example, for their stunning fresco artwork, their intelligent use of indoor plumbing and their development of the first written language of Europe - Linear A. Their original written language was based on hieroglyphics that communicated ideas as visual pictures of objects engraved into clay, being more like what we might think of as story-telling artwork (early comic strips) rather than the abstract languages of today. To convey more information and better articulate their ideas, the Minoans' hieroglyphic writing system evolved over time to have more of a linear flow while introducing numbers to expand the analytical and communicative ability of their language: Pictures, numbers, meanings, emotions. The connection is clear.